Active in the mid-15th Century, Cosmé Tura (AKA Cosimo Tura, AKA Cosimo di Domenico di Bonaventura) was an Italian painter of the early Renaissance. Tura was born in Ferrara, in north-central Italy, on the road between Venice and Florence. 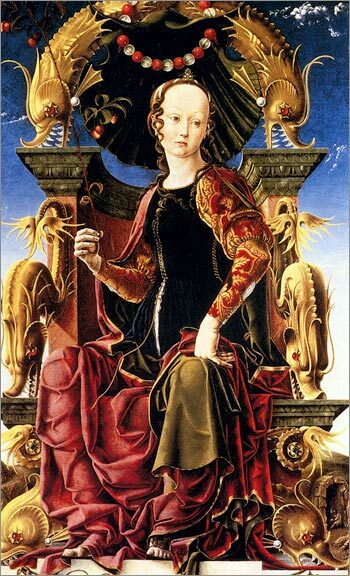 Though not as commonly mentioned as the other major centers of the Renaissance, Ferrara was home at one time or another to such notable artists as Andrea Mantegna, Giovanni Bellini, Pisanello and Titian. Of them, Tura was certainly possessed of one of the most unique visions and styles of painting. His figures are cut with precise edges into high relief, glowing with with bold, high-chroma colors, intensified by the use of adjacent compliments (e.g. greens and reds), and are frequently set within wildly stylized architectural elements and deep, sometimes forced, perspective. Plus the guy was just downright weird at times. I mean check out those copper “dolphins” adorning he throne of our muse above; where did those come from? The original is currently in the National Gallery in London, which has an image (unfortunately watermarked) with a zoom feature. This piece was probably part of a richly decorated room, no longer in existence, created for the d’Este family; which is assumed to have had several paintings of these “muses”. Tura also did murals and other works with mythological and secular themes, as well as religious works including a painting of the Annunciation, complete with nesting doves and an attendant squirrel, on the organ doors for the Duomo. There are some books available about Tura and his milieu, like Cosme Tura: The Life and Art of a Painter in Estense Ferrara by Joseph Manca and Cosme Tura of Ferrara: Style, Politics, and the Renaissance City, 1450-1495 by Stephen Campbell, though they are on the expensive side and I haven’t personally seen them. Like many artists of his time, Tura painted in both egg tempera and the exciting new medium of oil paint, which had been introduced to Italy by northern painters like Rogier van der Weyden. In this case Tura has painted this work in oil over top of a previous, somewhat different image in tempera on the same wooden panel. Some of his religious works are just as striking as this one. Look at his painting of the Madonna Enthroned, with it’s trompe l’oeil arch, wild architectural constructions, punched up colors and oddly languorous figures (larger but color shifted version here). Take a look at the intricately carved figures and weird details on the alcove/pedestal/throne or whatever it is behind the Madonna, including hanging grapes, winged lions, urns with faces and that bird-thing at the top with a human-looking head. Say what? I find this old style of art hauntingly beautiful. The work is always so painfully detailed so it’s great to study from a drapery perspective. I got a print of this made when I was at the National Gallery. It is one of the most impressive paintings there, which says quite a lot. I saw another Tura in Venice when I was there but it’s nowhere near as neat.